It is my honor and my pleasure to be with you this evening. I thank you Nupur for your gracious and kind words. Thank you for this wonderful family, the Desais who have opened the doors of their beautiful home for us tonight. And I thank all of you for coming despite the cricket and hockey and everything else going on. I was asked to speak about being purified. In the Bhagavad Gita Krishna says, “Of the purifiers I am the wind.” Tonight we are feeling the nice ocean breeze. There is also a beautiful verse: he Krishna karuna sindhu. I just met Mr. Mishra who is from Jagannath Puri. And just a few weeks ago I was in Puri. One early morning I was doing my meditation of chanting my Mahamantra to get purified and I was praying for a nice inspiration. I looked out at the ocean and there I saw a fisherman; very simple a row boat he had. That was big enough for one person. It was early morning and the waves were very high. And he was somehow or other trying to get his boat out where he could go for fishing. I was watching… he took his boat and a big wave knocked him down and the boat tipped over backward and went to the shore. He picked it up again, pushed in to the water and started going with the boat, pushing on his feet. Another big wave pushed him back. He was really struggling and somehow or other he got into the water – where he actually got into the water – and another big wave came and knocked him over. The boat went tumbling. He went to the water, got back on and finally when he came to the deep water he was very peaceful and he started doing his fishing. What was the inspiration of that, since I don’t eat fish or anything like that? You see, that fisherman he knew, he had total hundred percent faith that if he keeps trying he will come to calm waters and catch his fish. One time a little baby was crying and the mother had to jump up from the class that I was giving and take her baby out, so that the crying baby wouldn’t disturb people. Then I asked her afterwards, I said, “I’m really sorry that it must have troubled you.” She said, “No. No. It’s a pleasure. Even if that baby cries all night long – it’s a struggle – but because I know I’m helping someone I love, it’s a pleasure. If we don’t have people who love us, we don’t have anyone to love, then all of our so-called happiness is very superficial; it cannot reach the heart. Why? Because that is nature – janmadyasya hi yatah. The Vedanta sutra tells us that the source of everything, the source of our very life, the Absolute Truth Bhagavan Krishna, who has many names, God… Love for God is our innate nature. And when one loves God, it’s like watering the root of the tree, the Bhagavat Purana tells. That water naturally extends to every part of the tree, to leaves, the branches. And because God is the source of everything, Jagannath, Lord of all creation is the source of everything and everyone, the father and mother, aham bija praja pita, then when we connect with that love by experiencing the infinite love of God, who is karuna sindhu, and reciprocating with our love then our love reaches every living being in the form of compassion. 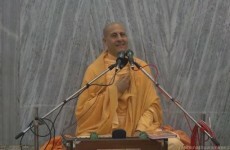 Bhaktivinod Thakur, he was one of the great saints of our tradition. He was actually the guru of my guru of guru. He lived at the time of British regime in India in Bengal. He was married. His wife was Bhagwati Devi, who was a great saintly lady. They had 10 children, several homes. He was a magistrate in the British legal system; such a good magistrate, so thorough and so compassionate, because he really was a saint. Even Babajis, Sadhus and Swamis would come to speak and receive his blessings, because he had such love and it manifested through compassion. When he would be in a court room and he would rule somebody guilty and send them to prison, usually that person would thank him. Because he was such a compassionate person, they would have faith by being in the courtroom with him – “If you are sending me in the prison that must be the best thing for me.” There are not too many judges like that anymore. He was a saint. He also lived in Puri. So this principle of compassion, Bhaktivinod explained, when love of God is actually tuned into within our hearts, it naturally expresses itself as compassion to all beings. 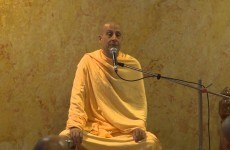 Because when we connect to our own true identity, which is sat-chit-anand, eternal, full of knowledge, full of bliss, we are the atma, we are part of God, then we recognize that everyone – wherever there is life, there is a sacred part of God – and then our greatest joy is to express our love through compassion. How to purify our hearts to actually make that connection? Sri Chaitanya Mahaprabhu, who lived in Puri for about 18years, he spoke a beautiful verse – nitya siddha Krishna prema – that eternal love for Krishna, for the once supreme source of all religions, is within the hearts of everyone. By taking to a spiritual practice, by associating with spiritually minded people, this love is awakened. 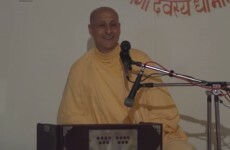 Satsang is where we connect – like events tonight – especially for the purpose of nourishing our spiritual side of life. And it’s a sacrifice to get here; like that boatman you had to go through the waves of cricket matches and hockey matches, so many other things, who were trying to keep you on the shore. But somehow you came. Satsang is so very sacred, because it gives us inspiration and faith of ‘what is within me, what is my potential, what I can do to this world’. And there is sadhana – through this faith we appreciate the value of our spiritual side of life, because we have a body and we have a mind, but we also have our self who is experiencing through this body and mind – the living force, the true me. And all three aspects need nourishment. A balanced life, a life of yoga, a life of true religion is to appreciate the needs and to cultivate and nourish our physical health, our emotional health and our spiritual health, and to help do that for others as well. Because ultimately, the body dies, na hanyate hanyamane sharire, but we never die. So before that time comes, to make that connection is to actually find a treasure that is not limited by the waves of time. That’s truly what everyone is looking for, that love that is unlimited and unending. Why are we looking for it? It’s because it’s who we are; it’s what our nature is and what our greatest potential is. So sadhana means to take out sometime to actually purify the mind. Mantra means to liberate the mind from arrogance, greed, envy, selfishness, illusion, to free our minds. Ceto-darpana-marjanam: the mind is compared to a mirror. When the mirror is covered with dust, that’s what we see and that’s what we think we are. All these material conceptions that are being perpetuated day after day become our idea of who we are. But when we cleanse the mind through these mantras, through our prayers, through our spiritual practice, we can actually see who we really are and we can reflect that grace, that brilliance of our true identity, that love, in everything we do. Our wealth, because we accumulate so much… our wealth may be knowledge, it may be skills, it maybe money, it maybe fame, power, that’s all considered wealth. In the bible Jesus sees, “It’s easier to put a camel through the eye of a needle than for a wealthy person to enter the kingdom of God.” Now that analogy is quite profound – putting camel through eye of a needle. But then afterwards he sees, “For a man it is not possible, but for God all things are possible.” Now in Bhagavat Purana, Kunti, the mother of the Pandavas, she says essentially the same thing, with the same conclusion that’s in the bible. Janamaishwarya .. – the greatest obstacle to spiritual progress… our wealth, lot of money, high education, beauty, and fame, she says these are the greatest impediments. But, if we understand… They are impediments if they bring out this tendency of arrogance and greed and envy, because that’s often what happens when we become attached to these things. What if we understand this simple principle? Bhoktaram yagya… maheshwaram, Krishna tells the peace formula. The easy process anyone can attain piece is just to understand – God or Krishna is the proprietor of everything. It means we are the caretakers of the sacred property to be used for a sacred purpose. And everything’s is meant to be used in a spirit of service. Samsiddir-hari-toshanam: to harmonize our body, mind and words in such a way that will be pleasing to God; pleasing to God means being of service to God’s children. Isn’t that what pleases every mother or father? And recognizing that ultimately God is the supreme object of our love, and we are the supreme objects of God’s love. If we just harmonize our life in this way, it becomes very simple. So our spiritual practice is to connect to that essence, sadhana. I write in this book I wrote, “The Journey Home”: when I was a young boy, I heard Martin Luther king. He said, “If you don’t have an ideal you are willing to die for, you have nothing worthwhile to live for.” And in those days, in 1960s, I was a teenager. It was a very unbelievable disconnection in American between the younger generation and older generation. In certain ways we were at war – in values – with the parents. It is called the counter culture. So Martin Luther king was very influential on all of us, because we saw so much racism and hatred in name of the ego – ‘I am white and you are black’. I wanted to find that idea. And I tried to find in politics and I tried to find it in counterculture, in social activities, and ultimately I heard Gandhi say, “You should be the change you want to see in world.” And I understood that change has to be spiritual if I make my ideal to find out who I really am. Then whatever I decide to be, whether I follow my father’s path to be a businessman – which he always wanted me to do, but he’s happy that I’m not – or whether I go into to some other field. I left America in 1969, I worked as a cook in a hospital; So I said, “Maybe I should be a doctor… or whatever that is, unless I find my ideal, then what do I really have to contribute? So that’s what led me on my spiritual expedition. And renunciation does not mean to be a Swami living without the bank account like me. And in my own life, it was revealed to me that I could best serve in that way as a Swami; that’s what I am. To give time to nourish that inner wealth that we have is so important. Wealth is sacred and purifying. It’s the essence of dharma, when used in compassion; to earn with integrity and spend with compassion. And this ego that I am this body, and all the designations of this body, and whatever is there in relationship with this body is mine, that ego is purified through seva, through really appreciating the value of service. Ravana, he wanted to enjoy taking Sita to his little island Sri Lanka. And hanuman, who is actually the son of the wind God, pavana, pavana-putra, with his strength and powers, he just wanted to bring Sita back to Ram. They were both intelligent, they were both powerful, they had the exact same facilities as each other, as far as the strength their intellect and everything else, but Hanuman used it in the spirit of seva and Ravana used it for his own selfish purpose. Now the Gita tells us that these two tendencies are within each of us – our lower tendency and higher nature. Like 2 dogs living in our hearts, good dog and bad dog. The bad dog wants to satisfy its envy, its arrogance and its selfish passions, and the good dog is our humility, our gratitude, will to serve with love, with compassion. And they’re both calling for our attention. Sometimes one barks longer than the other, and we have the choice. Sometimes that bad dog, it’s really barking, demanding our attention; and sometimes the good dog is very quiet. The one we choose to feed is the one that’s going to rule over the other. That means the choices that we make. Our potential is so beautiful. Just a few days ago I was at Oxford University and I was asked at the Oxford Union to be a part of a debate. And the person I was debating against was Dr. Cornel West; he is from Princeton University. I would like to tell you about that, but that will take long time, because in the process of debate we agreed to what each other said. And I was invited. But until I got to Oxford, they didn’t tell me which side I was on. So when I got there, I found out that I was on the side of “it is a vice” and I had to argue against them. But I had one other person on my side, a lady named, Shami Chakravarty, who is like a very powerful person from ‘News Week’ I think. But she didn’t come. The last minute she didn’t show up. So it was them against me. And my God! What kind of argument he gave, Cornel West! First students argued it. And this one, from the Debate Club of Oxford Union, and my God! They were passionately ripping into each other, trying to defeat each other. So I thought, “God! This is what I am supposed to do!” And then Cornel West, he, everything he was saying, he was getting ovations and he was giving cheering and people were clapping and stamping their feet. And except for me, every single man, about 450 people in Oxford Union Chambers, every man was wearing a full tuxedo. It’s a very formal event and every woman was in extravagant evening gowns. And I was wondering, “Where do I fit in? !” So after he speaks and he gets all these cheers, it was time for me to speak. And I began by saying, “If you ask a Swami to come to a debate, whatever side of the debate you put me on, I am gonna say what’s in my heart.” And I spoke my heart. Would you like to hear some of the things I said? I said, “What is extremism? It’s very subjective. There were people in high political power who considered Mahatma Gandhi and Martin Luther King to be dangerous, extremist, because they were boycotting the economic system; that’s extreme. They were breaking existing laws and they were subjecting their followers to brutality. The same time, there are people who do not consider it extreme; there was the strongest possible military action, to liberate surviving prisoners of the Nazis concentration camps. Then I quoted Malcolm X, as I read his speech, as there was one paragraph in his speech that I could really connect to, because I had to find something. He was a radical person in his 60s and 70s, 60s actually, because he got assassinated 2 months after he gave his speech at Oxford in 1964. He said that in order to understand whether extremism in defense of liberty is justified, one cannot look at the subject as an American, as an Africa, as an European or Asian, one must look at it from the perspective of the human being. All men are created equal. That’s the first principle of US constitution, that’s the basis of democracy, that’s the basis of humanity, and it’s the essence of every religion. The Gita tells that the real wisdom is to see not only all humanity, but every living being with equal vision, because everyone is the part of God; life is sacred. So, I said, “I want to argue today from a spiritual perspective, that arrogance that causes us to be so obsessed with proving ourselves superior to other to the point that we create hateful ideologies that oppress people – that is extremism to the very heart of humanity.” When I argued against that and I quoted Bhagavad Gita, and after I spoke, Dr Cornel West, who was my opponent, he jumped. This is something I think never happened in the 100s and 100s of years of the Oxford Union and all their debates. He jumped up right in front of all of these people in their tuxedoes and their evening gowns and he ran up to the center of the room where I was standing and embraced me and kissed me and said, “I agree with everything you said.” And I said, “Actually I agree with everything you said too.” Because it was just on two different levels. He spoke brilliantly. So this higher ground of what our real potential is, Srila prabhupada could see that in us and he gave that. He is recognizing that yes, you are a divine child of God, you are eternal, full of knowledge, full of bliss, you are perfect. There is no reason to be depressed. There is no reason to be arrogant. There is something sacred that you have, that you can connect to. So when I was watching that person on the fishing boat, after a while he was in very calm waters, just putting his net in and brings up so many fish and he was just so happy. But to get to that place, he had to endure some obstacles, from his perspective it was worth it and what we have the opportunity to receive.